Sign the petition to tell the Federal Trade Commission's Bureau of Consumer Protection to focus on creating more Elder Abuse Units and stronger legislation against those who commit financial crimes that victimize seniors. The Elder Abuse Prevention and Protection Act of 2017 helped control financial crimes against seniors by strengthening penalties for perpetrators, increasing appropriate training for federal investigators, and mandating that each federal judicial district have a prosecutor in charge of handling cases of elder abuse . However, financial fraud against seniors is still underreported, under-investigated, and under-prosecuted, and the issue continues to grow . Sadly, seniors often never recover — either financially or psychologically — from these hateful crimes . Worst of all, about 90% of the cases of elder financial abuse are by family members and caretakers . These people have access to seniors' bank accounts, so their corrupt use of the money is not always recognized as a serious crime . Often, the issue is treated as a civil dispute rather than a theft or property crime  or not noticed at all, due to the victim's cognitive impairment . 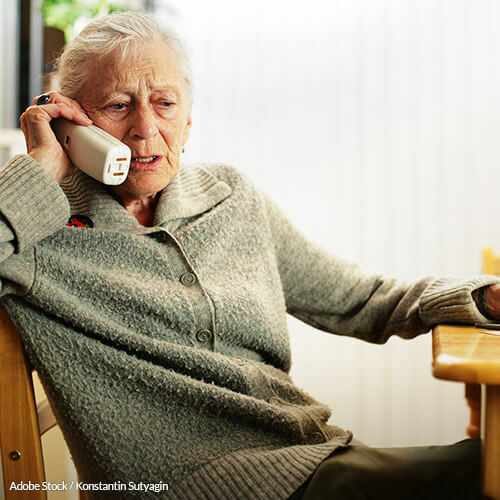 This dismissal of "grandparent scams" and other financial crimes against seniors is one reason why seniors are reluctant to report these crimes. It's also one reason why there are very few Elder Abuse Units in the country, despite the fact that there are more elder abuse cases than many other types of crimes that are afforded more resources . Roughly 1 in 20 seniors reports being financially abused in the past year, and so many more cases are never reported . We need to make sure the elderly members of our society are protected and that those who prey on them receive the strictest penalties possible. We appreciate the recent legislation that has improved certain aspects of this problem, but the federal government needs to continue to focus on this pressing matter. It's time for the issue of financial crimes against seniors get the attention it deserves in the public eye and also for politicians and law enforcement to take it more seriously. It's time for a significant decrease in "grandparent scams" and the misuse of funds by people who have access to senior citizens' bank accounts. In a perfect world, there would be no crime. Perhaps we cant create that world, but we can create a world where all crimes are properly investigated and the perpetrators are punished in accordance with their crimes. Sadly, that is not the world we live in right now. The public is more interested in physically violent and sensational crimes like gang activity, human trafficking, and child abuse. Elder abuse, particularly financial crimes, are not getting the attention they deserve. There are very few Elder Abuse Units compared to the number of crimes theyre called on to investigate, and the authorities are too quick to dismiss theft cases as civil disputes. But these crimes are heinous, despite their inability to make the front page of the newspapers. Peoples entire life savings are at stake, as well as their mental health. Seniors often never recover their money or their psychological well-being after a traumatic event like this. We need to be doing more to protect our seniors from financial crimes. We demand that more Elder Abuse Units be put in place to properly deal with financial crimes against seniors and that stricter laws be passed to prosecute those who commit these terrible deeds. That's 3,068 signatures! Let's keep the ball rolling.